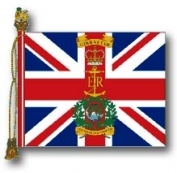 The Union Flag, in the centre of which is a foul anchor with the cipher of HM The Queen interlaced; above, St Edward's Crown surmounted by a scroll inscribed 'Gibraltar'; below, the globe surrounded by a laurel wreath, under which a scroll inscribed with the Corps motto 'Per Mare Per Terram'. The cords and tassels are of gold interwoven with silks of the Commando's colour which corresponds to the Commando lanyards worn by all ranks. A Blue Flag with a small Union Flag in the canton nearest the pike head, and the Cypher of HM The Queen surmounted by a St Edward's Crown in the other three corners; centre embellishments are similar to the Queen's Colour, except that the foul anchor is interlaced with the cipher of George IV and the Commando numeral appears below the motto. The cords and tassels are of gold interwoven with silks of the Commando's colour which corresponds to the Commando lanyards worn by all ranks.